It just about that time some good old fashioned web programming. Today we’re learning how to create an accordion style page – using my most favorite of tools: jQuery and CSS. We will try to accomplish an accordion that is so simple, yet useful enough for you to use in your existing pages. Ready to get started – let’s begin. We will use the H5 tags as our “Clicker” – once clicked, will hide the contents right underneath it. Click it again, and it will show the contents again. Now that we have our designated clickers, we create a couple of functions that toggle at every click. The first action, hides the contents below “$(this)” – which is the tag you just clicked. Remember – we only want to hide the contents up until the next H5 tag. It also changes the content of the span into a plus (+) symbol. The second action shows the contents below, and changes the span to a minus (-) symbol. At this point you already have a functional accordion. If you’re applying the code to an existing page, you are already working with the current styles. Although, using CSS3 for say the plus (+) and minus (-) span looks pretty cool – which I’m sure you’d want to use. And that is it! 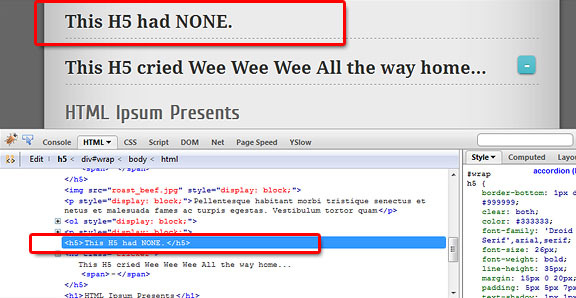 You have yourself an accordion page powered by jQuery. Feel free to grab this code and improve it. Maybe refactor it into a more plugin like code – make it more reusable. Or even – fix the choppiness issue in the slideUp / slideDown animation in certain browsers. In any case, please leave a comment on what you think of this code. There are no downloads for this tutorial because it’s pretty simple to follow. I also had to disable the demo – for housekeeping purposes. Good stuff.It has a meaningful information.thanks for the share. How can I make the default state collapsed? I sampled the demo on Chrome, IE7, and safari and it works beautifully. Did you happen to find out a cause or solution to why it is choppy in Firefox? I haven’t had time to investigate. That is very helpful tutorial for me and thank you for sharing this. But I wanna ask you something that how can I make it closed as default? Thanks in advance! you’d have to hide the elements as soon as doc is ready. $(‘selector’).hide() – something of that nature. Very slow in Firefox… I believe that looping through each heading adds to this. It would be faster if you, for example, only add a class to all H5s in a div and trigger the clicker function on all those H5. the looping only happens once on doc ready. and i wanted the script to apply on existing markup. so the only real criteria i have is if an h5 has something else below it – other than another h5. since most documents follow the same format. let me look into speeding this thing up. Nice tutorial, Is there a way that the default state will be collapsed? this is a great variation. However, i noticed that in Firefox 3.6 on Windows, it’s show in collapsing and expanding as oppose IE 6, in which pretty smooth. Why is that? Nice tutorial to design jquery for flyers. Thanks..